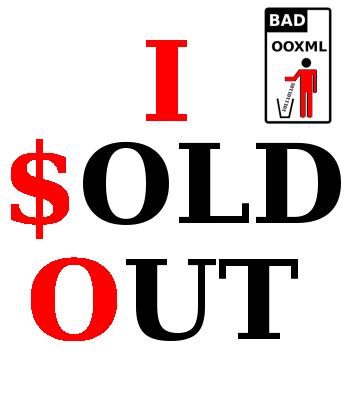 Buy the OpenXML specification now at the ISO store! Only 280USD or 342 Swiss francs. By the way, do you know is when the official burial date of ISO? The International Organization for Standardization (ISO) has published the specification for a Microsoft-created file format that caused bitter debate during its path to become an international standard. The documentation for Office Open XML (OOXML) runs 7,228 pages and can be ordered on CD from the ISO for 342 Swiss francs (US$285). The specification is named ISO/IEC DIS 29500:2008. Microsoft won a hard-fought battle in April when the ISO announced enough countries voted to approve OOXML as an international standard. The debate became so embittered that IBM, which backs ODF, threatened in September to consider leaving standards bodies that allowed dominant companies such as Microsoft to wield what it perceived as undue influence. Microsoft was accused of leaning on countries in order to secure enough votes for OOXML to pass. By the way, do you know when is the official burial date of ISO?